Ten years after KIDS, Larry Clark tackles the controversial subject of teens and race in LA, aiming his lens on an unlikely crew of Latino skate punk kids from the ghetto neighborhood of South Central who just want to be themselves. When Jonathan, Kico, Eddie, Spermball, Porky, Louie and Carlos take an impromptu skating trip to Beverly Hills one day, they get into trouble with the cops, enjoy sexu… al encounters with rich white girls, and face off against hostile boyfriends and suspicious neighbors. It takes all of their strength and cunning to make their way back home to the (relative) safety of South Central. 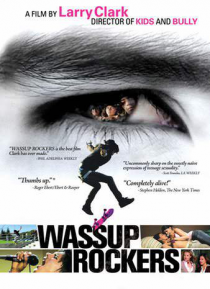 Overflowing with tenderness and sly humor, WASSUP ROCKERS is another bold vision of youth under fire from the incomparable Larry Clark.